The symbiotic growth of the automobile industry and law enforcement. 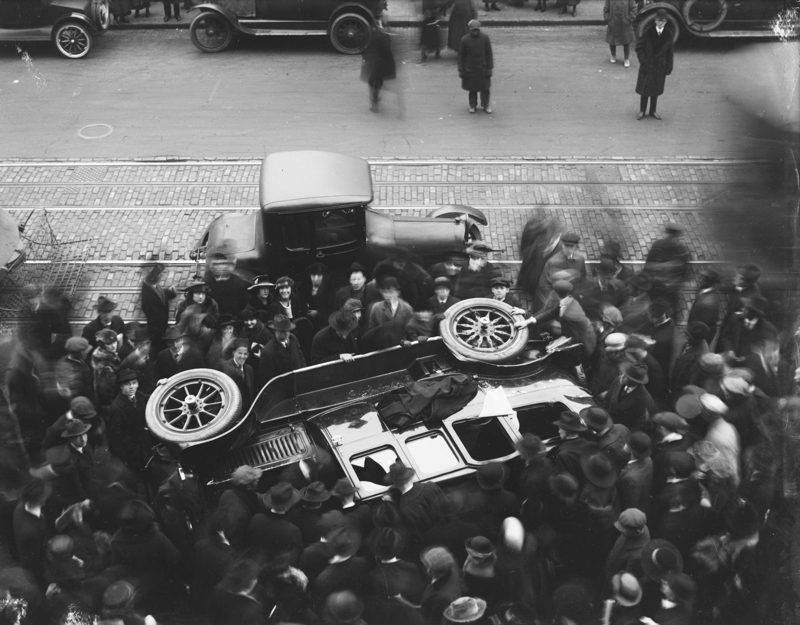 Crowd surrounding overturned automobile, c. 1915. Photograph by Harris & Ewing. Library of Congress, Prints and Photographs Division. America was not ready for the mass production of the automobile. At the turn of the century, thousands of motorized vehicles on Main Streets originally intended for pedestrians and horse-drawn carriages suddenly choked intersections and gave new meaning to the word traffic. Before mass-produced cars, even New York City’s Broadway had provided enough space that carriage drivers usually did not hesitate before making a turn. Afterward, they had to contend with horseless carriages for every square inch. Narrower streets, many unpaved, simply could not handle the traffic that piled up, and municipal officials were caught unprepared to deal with the chaos. Nineteenth-century enforcement tools proved disastrously inadequate in the anonymous, fast, and crowded world of automobility. In the search for solutions to the death and mayhem wrought by mass-produced cars, officials everywhere grappled with a fundamental puzzle: why did law-abiding citizens disobey traffic laws? “When will they end?” he groaned. “Is it to be wondered at that the adjournment of Congress and the state legislatures brings a universal sigh of relief?” another commentator wrote more sarcastically. 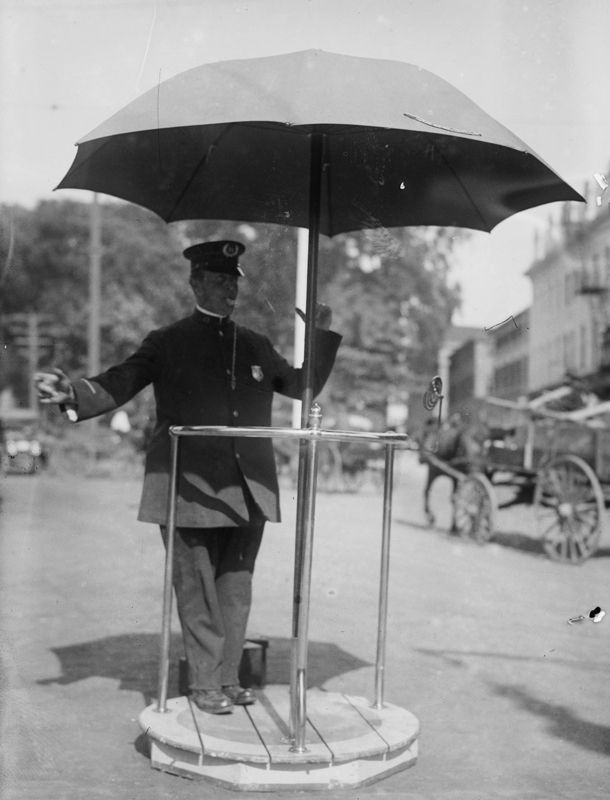 “So numerous [were] the…laws regulating traffic,” a police chief asserted in 1936, “that few indeed are the persons who can travel the streets or highways without violating one or many of them every hour of the day.” Suddenly, misdemeanors became mainstream. Violations were committed “up town, down town, all around town,” one New York paper rhymed. Another reporter from the Empire City explained this phenomenon based on his personal experience getting a driver’s license in 1921. The written portion of New York’s application included the following questions: “Are you thoroughly familiar with the New York State Motor Vehicle law? General Highway Traffic law? New York City Traffic Ordinances and Police Traffic Regulations?” The New York Times writer’s cheeky response was: “Who is?”—confirming the reality that no one knew, and therefore no one could obey, all the laws. Right before his road test, a fellow applicant advised him to watch out if the examiner “tells ye to pull up. Chances are ye’ll be ’longside a fire hydrant.” “Why that?” the writer inquired “innocently.” He learned right then and there that it was against the law to stop within fifteen feet of a hydrant. 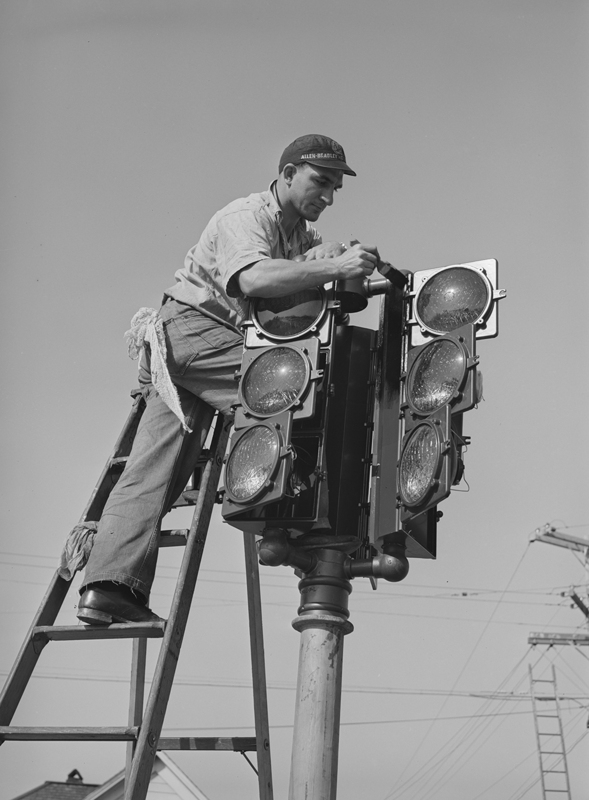 A traffic engineer for the state of Massachusetts, extrapolating from an early 1930s study of a typical intersection and assuming similar conditions at all other intersections in the same city, concluded that approximately 2.5 million traffic violations occurred daily. The proliferation of traffic laws had turned everyone who drove a car into a lawbreaker. Even Herbert Hoover “doesn’t always obey his own safety rules,” the papers reported in 1925, back when he was secretary of commerce and was heading the national movement for street and highway safety. “Dressed in immaculate white flannels and blue coat,” he was spotted jaywalking on H Street, near the Commerce Building, having “wormed his way thru one lane of parked cars.” He stepped out “directly in the path of a big limousine,” which had to slam to a sudden halt to allow “the distinguished safety expert” to “narrowly escape being run over.” Hoover, of all people, would have known the statistics identifying lawbreaking pedestrians as one of the leading causes of auto accidents. Notwithstanding the democratizing appeals of mass-produced cars, the media racialized drivers from the automobile’s earliest years. Not many African Americans owned or drove cars in the 1910s and 1920s, although exactly how many is uncertain. No statistic on black car ownership existed until the mid-1930s, even though the U.S. Census Bureau had been keeping track of information like “Type of Access Road Leading to Black Farms by Farm Location” (there were nine types). From this, one can surmise the relative prevalence of black drivers versus black farmers. In 1935 Atlanta, Georgia, one of the few cities that counted car ownership by race at the time, 17 percent of all black families had a car, compared with 63 percent of white families. For minorities, driving remained an elite prerogative until well after World War II. Disregarding their respectability, white journalists, travel writers, and photographers often portrayed black drivers as incapable of handling the modern technology. When, in 1910, the legendary black boxer Jack Johnson—who had just defeated the “Great White Hope” Jim Jeffries in the “fight of the century”—challenged the top-ranked racecar driver Barney Oldfield, mainstream papers, the New York Times among them, highlighted his traffic violations to suggest that he was a reckless driver and a public threat. In 1913, Johnson was arrested twice and ultimately convicted of violating the Mann Act for transporting—presumably driving—a white woman, a former paramour, across state lines for “immoral purposes.” (He received a presidential pardon in 2018.) Black newspapers sought to counter stereotypes and bad press with profiles of successful black drivers, auto mechanics, inventors, chauffeuring entrepreneurs, and driving instructors. But most persuasive in convincing government leaders that traffic violations were not a “racial habit,” as one writer admitted, was the daily display of citizens of every race, ethnicity, age, and gender who committed them. Lawbreaking was done “by children and by adults; it is done by frolicking urchins, by dignified merchants, by heedless flappers, and by staid women of mature years,” the reporter observed. This perhaps explains why, unlike the ideations of white culture, official documents and discourses on the traffic problem rarely mentioned race. When it came to self-reflection, most drivers did not consider themselves delinquent even when they violated the rules of the road. In the history of cars, law-abiding referred to upstanding traffic lawbreakers. Illustrating this belief was the response that the police often received: “I’m not doing any harm. Why don’t you catch a few burglars for yourselves instead of bothering good citizens?” Even the New Yorker who wrote candidly that no citizen followed all the traffic laws still believed that “the great majority of motorists…are honest, law-abiding, decent folks.” This dissonance was certainly not new. 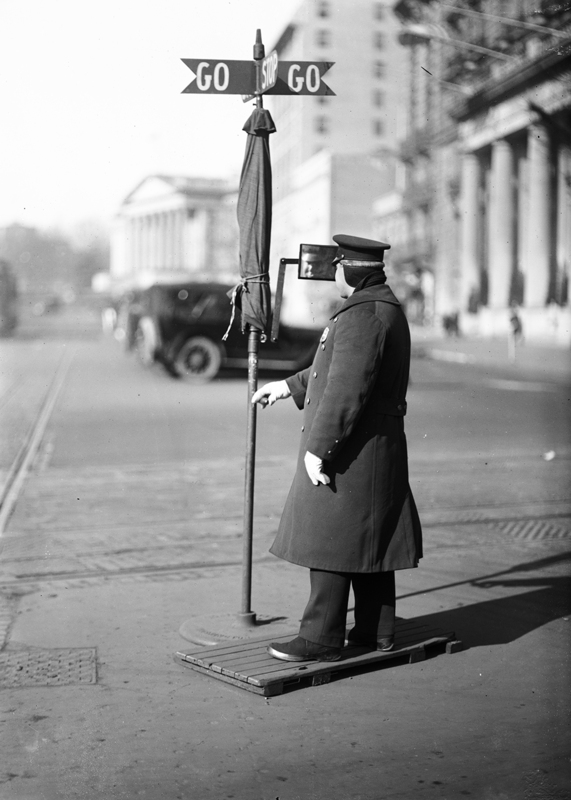 But in the early twentieth century, it frequently resulted in disaster, leaving policy makers bewildered that so many ordinary citizens resolutely disobeyed traffic laws. When police chief August Vollmer observed the main thoroughfares of Berkeley in the early hours of the day when there was no traffic, he found it “very difficult to conceive how accidents can occur on these streets.” Nothing in the conditions of the roads themselves foreshadowed scenes of collisions and pileups. Vollmer also did not think that mechanical issues, like “defective brakes, defective headlights, steering gear, and whatnot,” caused most accidents. From his daily observations, he came to the inescapable conclusion that the source of the problem was human. 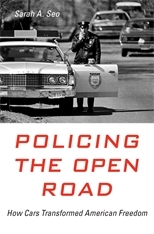 Adapted from Policing the Open Road: How Cars Transformed American Freedom by Sarah A. Seo, published by Harvard University Press. Sarah A. Seo is Associate Professor of Law at the University of Iowa, where she teaches criminal procedure and legal history. She clerked on the U.S. Court of Appeals for the Second Circuit and on the U.S. District Court for the Southern District of New York.